1 Shepherd of Israel, give ear, Thou who leddest Joseph like a flock, Thou that sittest [throned upon] the cherubim, shine forth. 2 Before Ephraim and Benjamin and Manasseh stir up Thy strength, And come for salvation for us. 3 O God, restore us, And cause Thy face to shine, and we shall be saved. 4 Jehovah, God [of] Hosts, How long wilt Thou be angry against the prayer of Thy people? 5 Thou hast made them eat tears [as] bread, And hast given them to drink [of] tears in large measure. 6 Thou makest us a strife to our neighbours, And our enemies mock to their hearts' content. 7 God [of] Hosts, restore us, And cause Thy face to shine, and we shall be saved. 8 A vine out of Egypt didst Thou transplant, Thou didst drive out the nations and plant it. 9 Thou didst clear a place before it, And it threw out its roots and filled the land. 10 The mountains were covered with its shadow, And its branches [were like] the cedars of God. 11 It spread its boughs [even] unto the sea, And to the River its shoots. 12 Why hast Thou broken down its fences, So that all who pass on the way pluck from it? 13 The boar of the wood roots it up And the beasts of the field feed on it. 14 God [of] Hosts, turn, we beseech Thee, Look from heaven and see, And visit this vine. 15 And protect what Thy right hand has planted, And the son whom Thou madest strong for Thyself. 16 Burned with fire is it--cut down; At the rebuke of Thy countenance they perish. 17 Let Thy hand be upon the man of Thy right hand, Upon the son of man [whom] Thou madest strong for Thyself. 18 And we will not go back from Thee; Revive us, and we will invoke Thy name. 19 Jehovah, God [of] Hosts, restore us, And cause Thy face to shine, and we shall be saved. This psalm is a monument of some time of great national calamity; but its allusions do not enable us to reach certainty as to what that calamity was. Two striking features of it have been used as clues to its occasion--namely, the designation of the nation as "Joseph," and the mention of the three tribes in ver. 2. Calvin, Delitzsch, Hengstenberg, and others are led thereby to regard it as a prayer by an inhabitant of Judah for the captive children of the northern kingdom; while others, as Cheyne, consider that only the Persian period explains the usage in question. The name of "Joseph" is applied to the whole nation in other Asaph psalms (lxxvii. 15; lxxxi. 5). It is tempting to suppose, with Hupfeld, that this nomenclature indicates that the ancient antagonism of the kingdoms has passed away with the captivity of the Ten Tribes, and that the psalmist, a singer in Judah, looks wistfully to the ideal unity, yearns to see breaches healed, and the old associations of happier days, when "Ephraim and Benjamin and Manasseh" encamped side by side in the desert, and marched one after the other, renewed in a restored Israel. If this explanation of the mention of the tribes is adopted, the psalm falls in some period after the destruction of the northern kingdom, but prior to that of Judah. The prayer in the refrain "turn us" might, indeed, mean "bring us back from exile," but may as accurately be regarded as asking for restored prosperity--an explanation which accords better with the rest of the psalm. We take the whole, then, as a prayer for the nation, conceived of in its original, long-broken unity. It looks back to the Divine purpose as expressed in ancient deeds of deliverance, and prays that it may be fulfilled, notwithstanding apparent thwarting. Closer definition of date is unattainable. The triple refrain in vv. 3, 7, 19, divides the psalm into three unequal parts. The last of these is disproportionately long, and may be further broken up into three parts, of which the first (vv. 8-11) describes the luxuriant growth of Israel under the parable of a vine, the second (vv. 12-14) brings to view the bitter contrast of present ruin, and, with an imperfect echo of the refrain, melts into the petitioning tone of the third (vv. 15-19), which is all prayer. In the first strophe "Shepherd of Israel" reminds us of Jacob's blessing of Ephraim and Manasseh, in which he invoked "the God who shepherded me all my life long" to "bless the lads," and of the title in Gen. xlix. 24, "the shepherd, the stone of Israel." The comparison of the nation to a flock is characteristic of the Asaph psalms, and here refers to the guidance of the people at the Exodus. Delitzsch regards the notions of the earthly and heavenly sanctuary as being blended in the designation of God as sitting throned on the cherubim, but it is better to take the reference as being to His dwelling in the Temple. The word rendered "shine forth" occurs in Psalm l. 2, where it expresses His coming from "Zion," and so it does here. The same metaphor underlies the subsequent petition in ver. 3. In both God is thought of as light, and the manifestation of His delivering help is likened to the blazing out of the sun from behind a cloud. In reference to the mention of the tribes in ver. 2, we need only add to what has been already said, that the petitions of ver. 1, which look back to the wilderness marches, when the Ark led the van, naturally suggested the mention of the three tribes who were together reckoned as "the camp of Ephraim," and who, in the removal of the encampment, "set forth third"--that is, immediately in the rear of the tabernacle. The order of march explains not only the collocation here, but the use of the word "Before." Joseph and Benjamin were children of the same mother, and the schism which parted their descendants is, to the psalmist's faith, as transient as unnatural. Once again shall the old unity be seen, when the brothers' sons shall again dwell and fight side by side, and God shall again go forth before them for victory. The prayer of the refrain, "turn us," is not to be taken as for restoration from exile, which is negatived by the whole tone of the psalm, nor as for spiritual quickening, but simply asks for the return of the glories of ancient days. The petition that God would let His face shine upon the nation alludes to the priestly benediction (Numb. vi. 25), thus again carrying us back to the wilderness. Such a flashing forth is all that is needed to change blackest night into day. To be "saved" means here to be rescued from the assaults of hostile nations. The poet was sure that Israel's sole defence was God, and that one gleam of His face would shrivel up the strongest foes, like unclean, slimy creatures which writhe and die in sunshine. The same conviction is valid in a higher sphere. Whatever elevation of meaning is given to "saved," the condition of it is always this--the manifestation of God's face. That brings light into all dark hearts. To behold that light, and to walk in it, and to be transformed by beholding, as they are who lovingly and steadfastly gaze, is salvation. A piteous tale of suffering is wailed forth in the second strophe. The peculiar accumulation of the Divine names in vv. 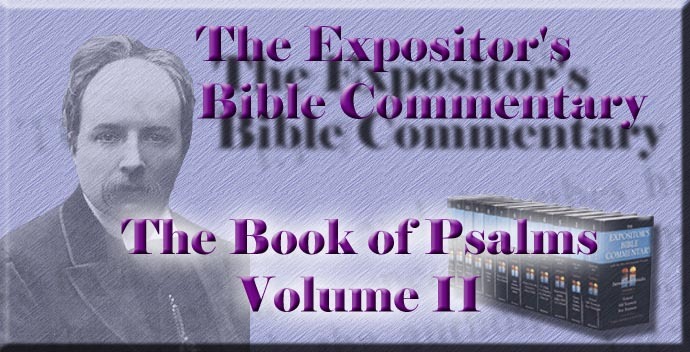 4, 19, is found also in Psalms lix. 5 and lxxxiv. 8. It is grammatically anomalous, as the word for God (Elohim) does not undergo the modification which would show that the next word is to be connected with it by "of." Hence, some have regarded "Ts'bhaoth" (hosts) as being almost equivalent to a proper name of God, which it afterwards undoubtedly became; while others have explained the construction by supposing the phrase to be elliptical, requiring after "God" the supplement "God of." This accumulation of Divine names is by some taken as a sign of late date. Is it not a mark of the psalmist's intensity rather than of his period? In accordance with the Elohistic character of the Asaph psalms, the common expression "Jehovah of Hosts" is expanded; but the hypothesis that the expansion was the work of a redactor is unnecessary. It may quite as well have been that of the author. The urgent question "How long?" is not petulant impatience, but hope deferred, and, though sick at heart, still cleaving to God and remonstrating for long-protracted calamities. The bold imagery of ver. 4 b cannot well be reproduced in translation. The rendering "wilt Thou be angry?" is but a feeble reproduction of the vigorous original, which runs "wilt Thou smoke?" Other psalms (e.g. , lxxiv. 1) speak of God's anger as smoking, but here the figure is applied to God Himself. What a contrast it presents to the petition in the refrain! That "light" of Israel has become "as a flaming fire." A terrible possibility of darkening and consuming wrath lies in the Divine nature, and the very emblem of light suggests it. It is questionable whether the following words should be rendered "against the prayer of Thy people," or "while Thy people are praying" (Delitzsch). The former meaning is in accordance with the Hebrew, with other Scripture passages, and with the tone of the psalm, and is to be preferred, as more forcibly putting the anomaly of an unanswering God. Ver. 5 presents the national sorrows under familiar figures. The people's food and drink were tears. The words of a may either be rendered "bread of tears"--i.e., eaten with, or rather consisting of, tears; or, as above, "tears [as] bread." The word rendered "in large measure" means "the third part"--"of some larger measure." It is found only in Isa. xl. 12. "The third part of an ephah is a puny measure for the dust of the earth, [but] it is a large measure for tears" (Delitzsch, in loc.). Ver. 6 adds one more touch to the picture--gleeful neighbours cynically rejoicing to their hearts' content (lit., for themselves) over Israel's calamities. Thus, in three verses, the psalmist points to an angry God, a weeping nation, and mocking foes, a trilogy of woe. On all he bases an urgent repetition of the refrain, which is made more imploring by the expanded name under which God is invoked to help. Instead of the simple "God," as in ver. 3, he now says "God of Hosts." As sense of need increases, a true suppliant goes deeper into God's revealed character. From ver. 8 onwards the parable of the vine as representing Israel fills the singer's mind. As has been already noticed, this part of the psalm may be regarded as one long strophe, the parts of which follow in orderly sequence, and are held closely together, as shown by the recurrence of the refrain at the close only. Three stages are discernible in it--a picture of what has been, the contrast of what is now, and a prayer for speedy help. The emblem of the vine, which has received so great development in the prophets, and has been hallowed for ever by our Lord's use of it, seems to have been suggested to the psalmist by the history of Joseph, to which he has already alluded. For, in Jacob's blessing (Gen. xlix. 22 seqq. ), Joseph is likened to a fruitful bough. Other Old Testament writers have drawn out the manifold felicities of the emblem as applied to Israel. But these need not concern us here, where the point is rather God's husbandry and the vine's growth, both of which are in startling contrast with a doleful present. The figure is carried out with much beauty in detail. The Exodus was the vine's transplanting; the destruction of the Canaanites was the grubbing up of weeds to clear the ground for it; the numerical increase of the people was its making roots and spreading far. In ver. 10 b the rendering may be either that adopted above, or "And the cedars of God [were covered with] its branches." The latter preserves the parallelism of clauses and the unity of representation in vv. 10, 11, which will then deal throughout with the spreading growth of the vine. But the cedars would not have been called "of God,"--which implies their great size,--unless their dimensions had been in point, which would not be the case if they were only thought of as espaliers for the vine. And the image of its running over the great trees of Lebanon is unnatural. The rendering as above is to be preferred, even though it somewhat mars the unity of the picture. The extent of ground covered by the vine is described, in ver. 11, as stretching from the Mediterranean to the Euphrates (Deut. xi. 24; 1 Kings iv. 24). Such had been the glories of the past; and they had all been the work of God's hand. In ver. 12 the miserable contrast of present desolation is spread before God, with the bold and yet submissive question "Why?" The vineyard wall is thrown down, and the vine lies exposed to every vagrant passenger, and to every destructive creature. Swine from the woods burrow at its roots, and "whatever moves on the plain" (Psalm l. 11, the only other place where the expression occurs) feeds on it. The parallelism forbids the supposition that any particular enemy is meant by the wild boar. Hupfeld would transpose ver. 16 so as to stand after ver. 13, which he thinks improves the connection, and brings the last part of the psalm into symmetrical form, in three equal parts, containing four verses each. Cheyne would put vv. 14, 15, before vv. 12, 13, and thereby secures more coherence and sequence. But accuracy in these matters is not to be looked for in such highly emotional poetry, and perhaps a sympathetic ear may catch in the broken words a truer ring than in the more orderly arrangement of them by critics. Ver. 14 sounds like an imperfect echo of the refrain significantly modified, so as to beseech that God would "turn" Himself, even as He had been implored to "turn" his people. The purpose of His turning is that He may "look and see" the condition of the desolated vineyard, and thence be moved to interfere for its restoration. The verse may be regarded as closing one of the imperfectly developed strophes of this last part; but it belongs in substance to the following petitions, though in form it is more closely connected with the preceding verses. The picture of Israel's misery passes insensibly into prayer, and the burden of that prayer is, first, that God would behold the sad facts, as the preliminary to His acting in view of them. The last part (vv. 15-19) is prayer for God's help, into which forces itself one verse (16), recurring to the miseries of the nation. It bursts in like an outcrop of lava, revealing underground disturbance and fires. Surely that interruption is more pathetic and natural than is the result obtained by the suggested transpositions. The meaning of the word in ver. 15 rendered above "protect" is doubtful, and many commentators would translate it as a noun, and regard it as meaning "plant," or, as the A.V., "vineyard." The verse would then depend on the preceding verb in ver. 14, "visit." But this construction is opposed by the copula (and) preceding, and it is best to render "protect," with a slight change in the vocalisation. There may be an allusion to Jacob's blessing in ver. 15 b, for in it (Gen. xlix. 22) Joseph is called a "fruitful bough"--lit., "son." If so, the figure of the vine is retained in ver. 15 b as well as in a. The apparent interruption of the petitions by ver. 16 is accounted for by the sharp pang that shot into the psalmist's heart, when he recalled, in his immediately preceding words, the past Divine acts, which seemed so contradicted now. But the bitterness, though it surges up, is overcome, and his petitions return to their former strain in ver. 17, which pathetically takes up, as it were, the broken thread, by repeating "right hand" from ver. 15 a, and "whom Thou madest strong for Thyself" from ver. 15 b. Israel, not an individual, is the "man of Thy right hand," in which designation, coupled with "son," there may be an allusion to the name of Benjamin (ver. 2), the "son of the right hand." Human weakness and Divine strength clothing it are indicated in that designation for Israel "the son of man whom Thou madest strong for Thyself." The inmost purpose of God's gifts is that their recipients may be "the secretaries of His praise." Israel's sacred calling, its own weakness, and the strength of the God who endows it are all set forth, not now as lessons to it, but as pleas with Him, whose gifts are without repentance, and whose purposes cannot be foiled by man's unworthiness or opposition. The psalm closes with a vow of grateful adhesion to God as the result of His renewed mercy. They who have learned how bitter a thing it is to turn away from God, and how blessed when He turns again to them, and turns back their miseries and their sins, have good reason for not again departing from Him. But if they are wise to remember their own weakness, they will not only humbly vow future faithfulness, but earnestly implore continual help; since only the constant communication of a Divine quickening will open their lips to call upon God's name. The refrain in its most expanded form closes the psalm. Growing intensity of desire and of realisation of the pleas and pledges hived in the name are expressed by its successive forms,--God; God of Hosts; Jehovah, God of Hosts. The faith that grasps all that is contained in that full-toned name already feels the light of God's face shining upon it, and is sure that its prayer for salvation is not in vain.